Yep, I made some more Animal Crossing: New Leaf designs over the last few days, three of which make pretty awesome "cushion consoles," if I do say so myself. Sadly, the other one looks a bit wonky as a cushion, but it looks rather nice as a poster if you're into that sort of thing. I should've known it would be tough to translate those circular "feet" that sit at the base of the system to such a design, but unfortunately I didn't realize it until Cyrus had finished applying it to a cushion. I actually attempted a PSone design as well, but it didn't look anywhere as nice as the one above, so I ditched it. 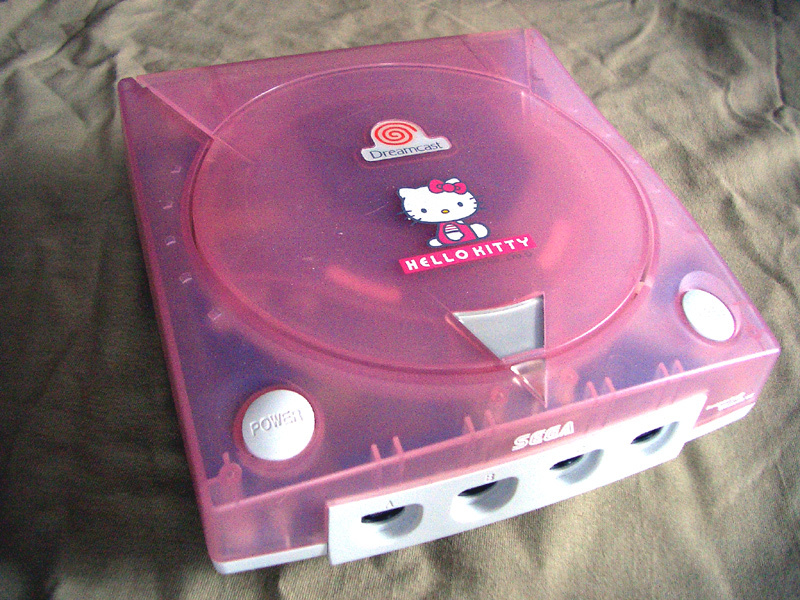 Shortly after, I decided to alter my previously completed Dreamcast design to make it look like one of the Japan-only (of course), Hello Kitty-branded Dreamcasts I've drooled over for years. It wasn't long, though, before I went back and tweaked the design a bit to make a blue Hello Kitty Dreamcast as well. I forgot to grab a screenshot of the blue system in its current resting place (in my guy character's robo-themed bedroom), but here's a shot of the pink one in my girl character's living room. Is this the last of my New Leaf design posts? Possibly, although I'm considering trying a few (more) handheld designs in the next few days. Should they turn out less hideous than the Game Gear and Neo Geo Pocket Color ones I came up with yesterday, I'll share them here as well. Waitwaitwait...you put pink in the girl's house and blue in the boy's? Bryan! I'm shocked and appalled! Thanks! I like them, too. In fact, I think they may be the best ones when it comes to how they look on a cushion (although the PC Engine looks pretty great, too). Yep, it was one of the first ones I made. Check the links at the bottom of the post. Also, it's nice to meet a fellow PC Engine fan! I absolutely love the system myself. I don't know if I have a favorite game system, but the PCE definitely is one of them (along with the Famicom). Ha ha! Thanks, Riven :) I wasn't sure if people would like them or think "WTF?" Of course, I'm sure some folks will think that, but as long as a few (like you) like them, that's all that matters. I need more than 10 custom design slots on me to have access to all this awesome and cuteness! I hear ya, Reggie. I was OK at first, but now I'm having to choose between them Arrrrrrgh!!! You're doing a great service to the community! However, after I got your pc-engine design, I saved it over a portrait of my mayor I had done to resemble the "Girl With The Pearl Earring" painting by Vermeer, and because of that the stained glass window of my own face (for my creepy upstairs shrine, of course) was changed. Now it looks like I worship the PCE, haha. I guess that's about right. Ha! I love it, Jeremy. And, yes, there's nothing wrong with worshiping the PC Engine. I worship mine all the time! I'm not playing New Leaf, but I just wanted to drop a quick note to say that I appreciate the effort to create these awesome designs. This is the kind of stuff that makes playing games feel like an "event of the moment". Rock on!